I take pride in creating fine portraits of families in their home, in their yards, in parks and by the lake, in any place that is beautiful and meaningful to the family. But I particularly love to take portraits of families in my splendid garden studio on the grounds of the Milam-Clark estate in Claremore. Special care is taken to meet with the family ahead of time, to discuss clothing and preparation for the portrait session. This insures that everyone is relaxed and confident and looking their best on the day of the portrait. 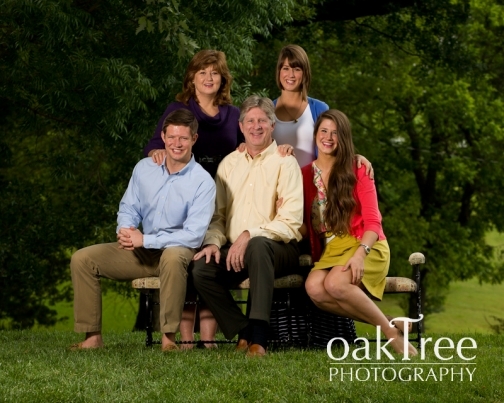 Families in and around Tulsa, Oklahoma and throughout Rogers County proudly display in their homes wall portraits taken by Oak Tree. They know that they possess a timeless heirloom portrait that they can enjoy for generations. to come.